After the first six to eight weeks of life, you should start weaning your puppy. However if the mother has certain complications or infections this can be done much earlier. Feeding your puppy should not be an uphill task. It is something you should do with lots of passion and certainty. Puppies require high calories and nutrients and therefore should be fed well. It is therefore important to know the Do’s and Don’ts when feeding your puppy. Remember puppies need lots of energy as they grow, therefore require enough nutrients. There are various varieties of puppy food available. During the first three weeks of life you can begin by feeding your puppy milk if the mother’s milk is not adequate. However from six weeks you can try semi –moist and tinned, complete dry foods, homemade foods and treats. Be sure to read the labels before purchasing any puppy food as most commercial products have ingredients with no nutritional value. Choose a food brand that was made with a puppy’s nutritional requirements in mind. This is very important as different brands contain different nutrients that rarely blend well. 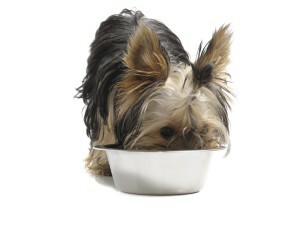 Changing your puppy’s diet abruptly might disrupt its growth as the body system has to adopt to that particular brand. It is advisable that you identify a non-reactive brand and stick to it. This is more like a feeding your puppy schedule that you can maintain. Meal frequency matters a lot for puppies a lot. Very young ones should be fed at least four times a day. As your puppy grows older you can change the number of meals to either two or three per day. Feeding frequent but small meals is considered better than one large meal. First your puppy stays hungry for long and might get stressed if you only feed once. In addition there is so much anxiety associated with one large meal. Generally puppies differ and feeding your puppy how much food depends on how active it is. As such be keen and watch the amount of food your puppy consumes. This will also assist you to know when the puppy is unwell as they tend to eat less when sick. Most pet owners love the idea of carrying home raw meat for their puppies. Never try these because there are several health risks associated with it. Raw food has a lot of bacteria and is not easy to chew. Raw meat for instance has strong bones which can discourage your puppy from eating. Therefore desist from feeding your puppy raw meat. You can give treats once in a while but they should form a minimal percentage of your puppy’s diet. Table scraps on the other promote begging and can be embarrassing when you have guests. It is just like teaching your puppy good manners. Eating from the bowl at scheduled feeding times is a good and desirable habit. Table scraps also do not have the required nutritional balance for a growing puppy. Feeding with adult dogs implies you will be feeding the same food. Adult dogs are used to scrambling for food amongst themselves. Therefore your puppy will eat less or no food at all. Besides older dogs require less energy and nutrients. 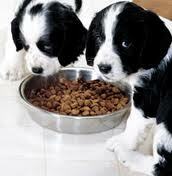 Your puppy still has high nutritional requirements and should be fed on good dry kibble puppy food. 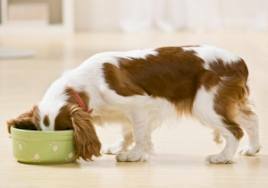 Remember what you feed your puppy determines whether it will grow to be an adult or not. 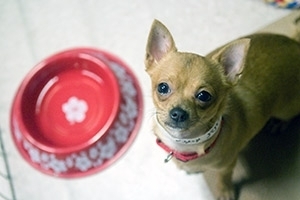 Feeding your puppy well will automatically yield good results. Carefully read the labels and know what works best for your puppy.